The theory of natural selection (part 1) - Are there examples of rapid evolutionary change? Can we estimate the fitnesses of the peppered moths? For the first method we need measurements of the frequencies of the different color forms for at least two times; we can then estimate the gene frequencies from the genotype frequencies, and substitute them in equation giving s , the selection coefficient. The melanic form was first seen in 1848. Breeding experiments suggested that the difference in color was controlled by one main locus. The original, peppered form (called typica) was one homozygote (cc ) and the melanic form (called carbonaria) was another homozygote (CC ), and the C allele is dominant. Haldane estimated that melanic C gene would have had a frequency of 0.00001. By 1898, the frequency of the light colored (typica) genotype was 1 - 10% in polluted areas (it was not more than 5% near Manchester, for example, implying a gene frequency of about 0.2). There would have been about 50 generations between 1848 and 1898. We now know all we need. What selective coefficient would generate an increase in its frequency from 0.00001 to 0.8 in 50 generations? Such a change in 50 generations, it turns out, requires s = 0.33: the peppered moths had two-thirds the survival rate of melanic moths. The calculations are rough; but they show how fitness can be inferred. Kettlewell measured survival rates by mark-recapture experiments in the field. He released melanic and light colored peppered moths in known proportions in polluted and in unpolluted regions, and then later recaught some of the moths. He counted the proportions of melanic and peppered moths in those recaptured from the two areas. 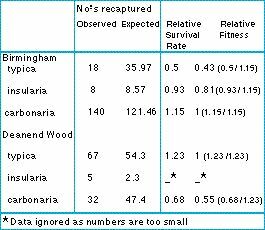 The table gives some results for two sites, Birmingham (polluted) and Deanend Wood, an unpolluted forest in Dorset, England. In Birmingham, melanic moths were recaptured at about twice the rate of light colored ones, implying s = 0.57. This is a higher fitness difference than the s = 0.33 implied by the change in gene frequency. Even if we round s = 0.57 down to s = 0.5, Haldane calculated that the change in gene frequency from 0.00001 to 0.8 would have been accomplished in 27 generations (with complete dominance) or 37 generations (with heterozygotes intermediate), rather than the 50 or so generations actually taken. The discrepancy is unsurprising because both estimates are uncertain. Whatever the cause of the discrepancy, the two calculations illustrate two important methods of estimating fitness. Table: frequencies of melanic and light peppered moths from two sites in the UK: Birmingham (polluted) and Deanend Wood (unpolluted). The observed numbers are the actual numbers recaught: the expected numbers are the numbers that would have been recaught if all the morphs survived equally. From Kettlewell (1973).